Identify personnel and rooms with custom name plates. Each plate may be customized by selecting the size, number of lines and material color. You may choose to use a template for your 2x8, 2x10 or 2x12 name plates, and if a template is not available, or you need a custom-sized plate, a custom design may be created and saved exclusively for your use. Quantity Discounts: We offer generous price discounts on quantity purchases. See individual order pages for more information. Ease of ordering: We maintain your layout and order information to make it easy to order additional name plates. Fast, friendly service: Your order will be quickly processed, and customer service representatives are always available to answer any questions. 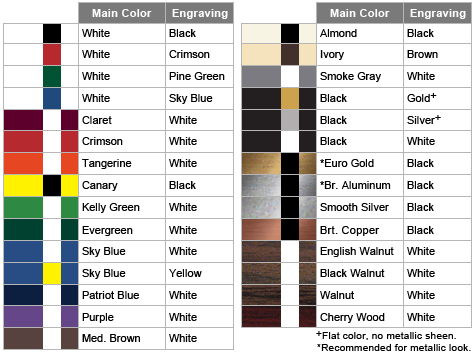 Custom engraved name plates identify names and occupations. You select the size, text location, material and color. Custom sizes are also available up to 24 square inches. Our experienced designers will follow the instructions from the order page and create a custom layout for you. You will receive a proof that will show the layout of your name plates, and you will be able to work with the designer until you approve the layout. There is a one-time set-up fee of $10.00. We will maintain your layout and order information to make it easy to order name tags for new employees. Production will begin as soon as we have an approved proof and a complete, properly formatted list of the text to be engraved. Once the approved proof and list have been received, and production has been started, most orders can be shipped within 24 hours. Text will be engraved into the plastic, allowing the core color to show through the top layer of the plastic, creating a very durable name plate. 29 plastic color combinations are available. Prices range from $9.93 to $11.45 each. Quantity, size and selected options may affect the price. Professional laser engraved metal name plates are sure to leave a lasting impression. Metal is available in three finishes: smooth, lacquer and mirror. 18 metal colors are available. Prices range from $11.25 to $12.17 each. Quantity, size and selected options may affect the price. Choosing to use one of the available templates can save you both time and money. Because the design of the name plates is embedded in the templates, they do not require a proof approval, and the set-up fee is waived. Production starts as soon as we receive your order and list of names. You customize your order by selecting the size, material, color and font. One and two line templates are available in three plate sizes (2x8, 2x10 and 2x12 inches). Your custom information will be rotary engraved into the plastic creating professional, high-quality name plates. 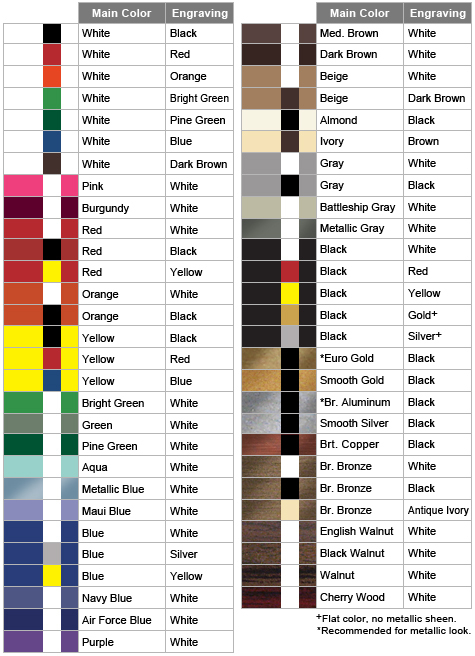 45+ material colors are available. Prices range from $9.93 to $14.76 each. Quantity, size and selected options may affect the price. High-quality laser engraved metal nameplates will set your company apart. One and two line templates are available in two plate sizes (2x8 inch and 2x10 inches). Metal is available in three finishes: smooth, lacquer and mirror. 18 metal colors are available. Prices range from $11.25 to $15.48 each. Quantity, size and selected options may affect the price. Having a strong brand is important as an individual and for your business. Ordering matching name tags and name plates makes it easy. 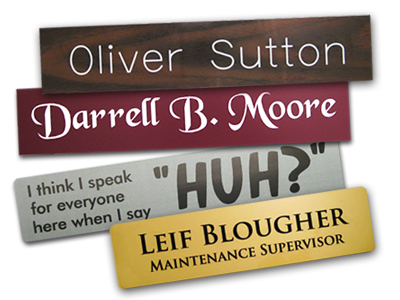 Name Tag, Inc. carries a wide selection of name tags and name plates. If you don't see what you want, give us a call and we'll help you find it. Large selection – Low prices! Five plate minimum on first order. We maintain your ordering information for fast and convenient reordering. No minimum on reorders. 2x8 inch nameplate with one line of engraving. Mounts, holders and adhesive sold separately. Complete pricing tables are available on the order pages. All plastic name plates that use a stock template will be produced on rotary plastic using one of these rotary fonts.